People often use the term barbecue when referring to foods that are grilled, but barbecuing and grilling are two completely different processes. 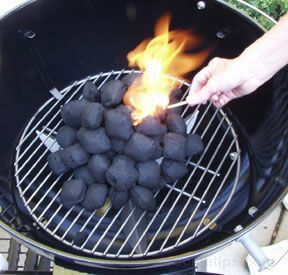 Barbecuing refers to foods that are cooked with a long, slow process using indirect, low-heat generated by smoldering logs or wood chips that smoke-cook the food. The fuel and heat source are separate from the cooking chamber, but the cooking chamber contains enough heat to properly cook the food over a long period of time. The cooking chamber fills with smoke, giving the food its characteristic smoked flavor, which varies depending on the type of wood that is used for the fuel. The best temperature for barbecuing is between 200°F and 300°F. If the temperature rises above 300°F, it is considered grilling. Grilling refers to foods that are cooked quickly and directly over high heat. Grilling temperatures typically reach 500°F or more, but any temperature above 300°F is considered a grilling temperature. The high heat of grilling sears the surface of meat, creating a flavorful browned crust.